Cosmetics manufacturing poses many respiratory health risks to employees. The loosely regulated industry of cosmetics uses numerous ingredients that may present harmful side effects exposure occurs in large and continual doses. These ingredients have been shown to be safe for consumer use, but during manufacturing, employees become exposed to large amounts of particulate causing safety concerns. 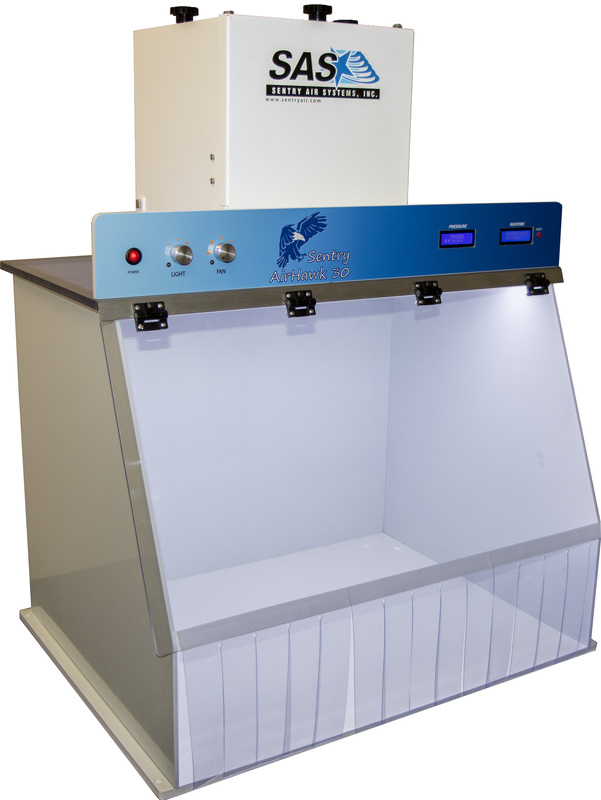 Cosmetic manufacturers must provide appropriate engineering controls, such as fume extractors, to protect employees from long-lasting health effects. The FDA loosely regulates the cosmetic industry. 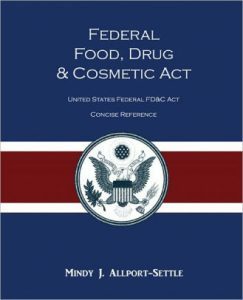 The Food, Drug, and Cosmetic Act of 1938 currently governs the cosmetic manufacturing industry (Ref. 1). Under this regulation, cosmetic manufacturers cannot misbrand products and must gain approval of all color pigments (Ref. 2). All other ingredients, besides pigments, do not need preapproval before releasing the product to the market. The FDA has only banned 10 chemicals or ingredients, while the European Union has banned 1,400 ingredients (Ref. 1). In the US, the FDA allows cosmetic manufacturers to use known carcinogens in products, like coal tar, simply by placing a warning label on the package (Ref. 2). Likewise, cosmetics manufacturers are not required to report health complaints to the FDA, instead the FDA only finds out about health concerns from products when consumers report directly to them (Ref. 2). After safety concerns are reported to the FDA, the FDA can issue a voluntary recall of all affected products. Similarly, the FDA does not set any standardized testing for the safety of ingredients (Ref. 2). The FDA has the Guidance for the Industry recommending good cosmetic manufacturing practices but does not enforce the guidelines mentioned in this report. Cosmetics encompass a wide variety of products, but most share similar manufacturing processes. Certain parts of the process and some products generate more airborne particulate and pose more risks than others. During the weighing step of cosmetic manufacturing, employees measure out specific amounts of ingredients. The ingredients vary depending on the products. 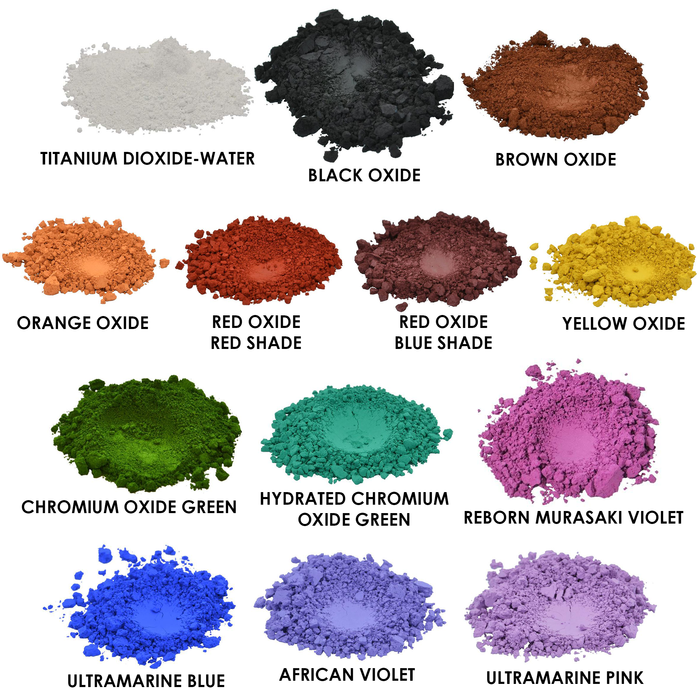 For eyeshadow, ingredients consist of mica, zinc stearate, and pigments such as iron oxide (Ref. 3). For liquid or oil-based products like mascara, ingredients entail a combination of water, emulsifiers, pigments, binding agents and other ingredients (Ref. 4). For powder-based cosmetics, the employee pours the ingredients mixture into a large blender (Ref. 3). Then, the attendant adds coconut oil to the mixture while the mixer completes the processing (Ref. 3). For liquid and oil-based products, the technician creates two mixtures: oil and water-soluble (Ref. 4). The oil mixture is melted together and then mixed separately from the water-soluble (Ref. 4). After heating the water-soluble mixture, the employee adds pigments and oil-soluble mixture to the water, then heats the mixture while mixing the ingredients together (Ref. 4). Product Testing in Eyeshadow (left) and Mascara (right) (Ref. 3 & 4). Each batch of a powder-based cosmetic must complete testing to ensure color accuracy, durability from drop tests, and shelf life (Ref. 3). Employees compare the sample from the batch to the control cosmetic (Ref. 3). 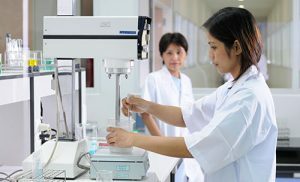 For liquid-based cosmetics, the employee will test the sample for thickness and pH level (Ref. 4). Product testing must be completed before packaging of the batch. For powder based makeup, the employee pours the mixture into the dispenser, where the machine dispenses the product into a tin (Ref. 3). After pressing, the employee places the tin into a larger packaging and then labeled for sale. Liquid or oil-based products undergo similar processes: dispensed into containers, finishing, additional parts of the containers added such as lids and applicators, and then labeled (Ref. 4). In order to bring a new product to the market, cosmetic manufacturers task cosmetic chemists to develop future products in a state-of-the-art laboratory. The scientists determine the concentration, test for allergens and chemical reactions, and consider cost during the research process. For pigment manufacturing, the employee mixes the raw pigments with resins and grinds them into smaller particles sizes to ensure an even dispersion of pigment in the final product (Ref. 5). The final pigment particle size is usually about 1.4 µm (Ref. 5). For processing, the pigment is refined through a heavy-duty covered mixer (Ref. 5). A cosmetic laboratory synthetically creates the majority of metal oxides (zinc oxide and iron oxide) utilized in cosmetics to ensure hygienic properties (Ref. 6). Known carcinogens can be found in many cosmetics through ingredients and byproducts of the manufacturing process. Although accepted as safe in use for consumers, these ingredients may present harmful side effects for repeated chronic exposure during the manufacturing process without proper respiratory protection (Ref. 7). Below are some known carcinogens found in cosmetics, products they can be found in, potential health effects, and regions, if any, that ban the chemical’s use in cosmetics (Ref. 8). Mineral Oils Eye shadow, moisturizer, lip gloss, lipstick, conditioner, hair color, bleaching, facial treatment, styling gel/lotion, blush, concealer Targets eyes, skin, and respiratory system. Silica Lipsticks, lip gloss, eyeliner, foundation, sunscreen, lotion, and shampoo Respirable can penetrate lungs, lung cancer, targets eyes and respiratory system. Other than carcinogens, nanomaterials in cosmetics may create respiratory health hazards. Most cosmetics contain ingredients created through nanotechnology (Ref. 9). Nanotechnology creates nanomaterials in the size range of 1 to 100 nanometers (1/1,000,000 mm or 1/1,000 µm). Nanosized versions of materials create new properties allowing for better UV protection, skin penetration, long-lasting effects, increased color, and skin rejuvenating effects. Due to the small size of these nanoparticles, inhalation of employees working with these materials creates a threat to employee respiratory safety. Small particles can easily be inhaled and become deposited deep within the lungs. In particular, titanium dioxide has been recognized as potentially carcinogenic to humans (Ref. 10). Animal studies have shown an increase in respiratory tract cancers after titanium dioxide exposure to mice (Ref. 10). Moreover, NIOSH recognizes the hazards of carbon nanotubes and nanofibers exposure (Ref. 11). The organization has recommended restricting the exposure level to 1 µg/m3. No studies for humans have proven any adverse effects for carbon nanotubes and nanofibers. However, studies involving mice indicate signs of developing lung disease including pulmonary inflammation, granulomas, fibrosis, intratracheal instillation, and carcinogenic effects (Ref. 11). NIOSH recognizes these signs as similar to human signs when developing occupational lung diseases. They suggest treating all carbon nanotubes and nanofibers as respiratory hazards and monitoring exposure to ensure airborne levels are below the recommended level (Ref. 11). Employees are at risk for exposure to potentially hazardous materials during the weighing, grinding of pigments, and mixing steps of the manufacturing process. Employees may also come in contact while fixing machines, moving batches, and when materials are settling in a machine after pouring. Likewise, while developing new makeup or cosmetics, scientists may be exposed to particulate during the research and testing of new products. Also, when working with powder based cosmetics such as eye shadows, blushes, foundations, pigments, and cosmetics containing nanomaterials, presents a higher chance of particulate respiratory exposure. 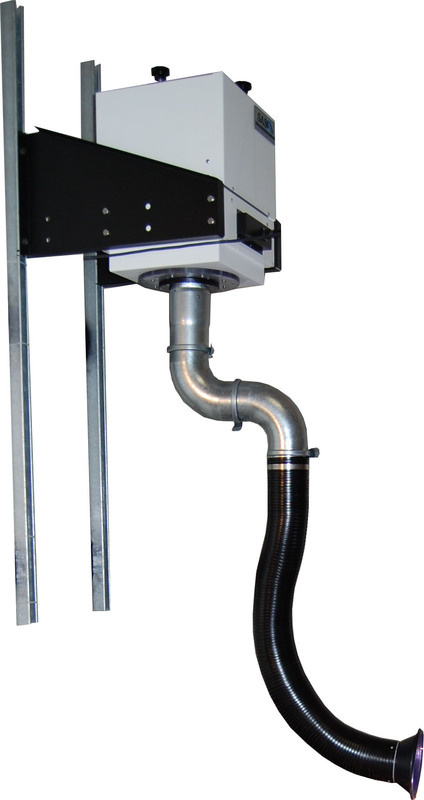 Cosmetic manufacturers should install engineering safety controls for particulate extraction devices and train employees to utilize ventilation systems to prevent exposure to harmful particulate. Depending on the application, Sentry Air offers numerous solutions to protect employee respiratory health. • Mounts on wall to free up floor space in the workspace area. 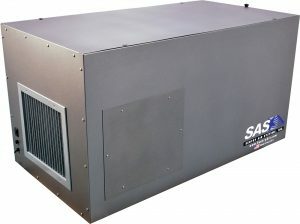 Consult one of our application solution experts today to help you select a particulate control system for your facility! 1. Flyntz, Amy. “The Personal Care Products Safety Act: What It Is and Why You Should Know About It.” Well Insiders. 26 Apr 2018. https://wellinsiders.com/personal-care-products-safety-act-what-it-is-why-you-should-know-about-it/. 2. Reddy, Manisha. “The Hazards of an Unregulated Cosmetics Industry.” Loyola University Chicago School of Law. 5 Dec 2017. http://blogs.luc.edu/compliance/2017/12/05/the-hazards-of-an-unregulated-cosmetics-industry/. 3. “Solid State Drives, Eye Shadow, Limousines, Dead Blow Hammers.” How It’s Made. Science Channel, Season 22, Ep 12. 2013. https://youtu.be/J6U7k4wBlrg. 4. “Mobile Concert Stages, Mascara, Continuous Miners, Wood Gift Boxes.” How It’s Made. Science Channel, Season 23, Ep 8. 2014. https://youtu.be/DNOr2kQAI_c. 5. Birks, Ingmārs; Grigale-Soročina, Zane; and Mārtiņš Kalniņš. “Analysis of Pigment Process and Production techniques for Use in Nail Polish Systems.” Solid State Phenomena. Oct 2017. https://www.researchgate.net/publication/320301327_Analysis_of_Pigment_Process_and_Production_Techniques_for_Use_in_Nail_Polish_Systems. 6. Novakovich, Jen. “A Guide to Color Additives in Cosmetics.” The Eco Well. 18 Nov 2017. https://theecowell.com/blogs/well/color-additives-in-cosmetics. 7. Barrett, Julia. 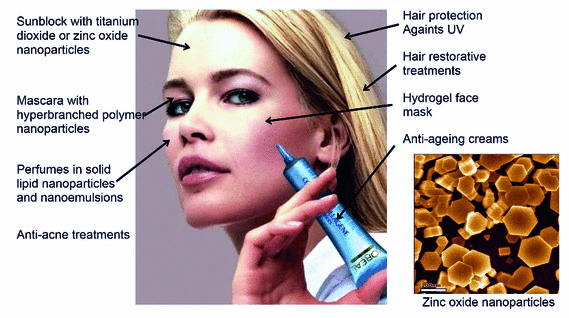 “Chemical Exposures: The Ugly Side of Beauty Products .” Environmental Health Perspect. Jan 2005. https://www.ncbi.nlm.nih.gov/pmc/articles/PMC1253722/. 8. “Carcinogens in Cosmetics.” Campaign for Safe Cosmetics. http://www.safecosmetics.org/get-the-facts/chemicals-of-concern/known-carcinogens/. 9. Jose, Shoma; Raj, Silpa; and Sabitha, M. “Nanotechnology in Cosmetics: Opportunities and Challenges.” J Pharm Bioallied Sci. Jul-Sep 2012. https://www.ncbi.nlm.nih.gov/pmc/articles/PMC3425166/. 10. Reliene, Ramune; Schiestl, Robert H.; Solaimani, Parrisa; Trouiller, Benedicte; and Westbrook, Aya. “Titanium dioxide nanoparticles induce DNA damage and genetic instability in vivo in mice.” Cancer Res. 15 Nov 2009. https://www.ncbi.nlm.nih.gov/pmc/articles/PMC3873219/. 11. NIOSH “Occupational Exposure to Carbon Nanotubes and Nanofibers.” Current Intelligence Bulletin 65. 2013. https://www.cdc.gov/niosh/docs/2013-145/default.html.